ASPD's Division of Non-Public Supports is available to support both public school district ESSA program administrators and non-public school administrators in implementing the new ESSA requirements affecting students attending non-public, private schools. 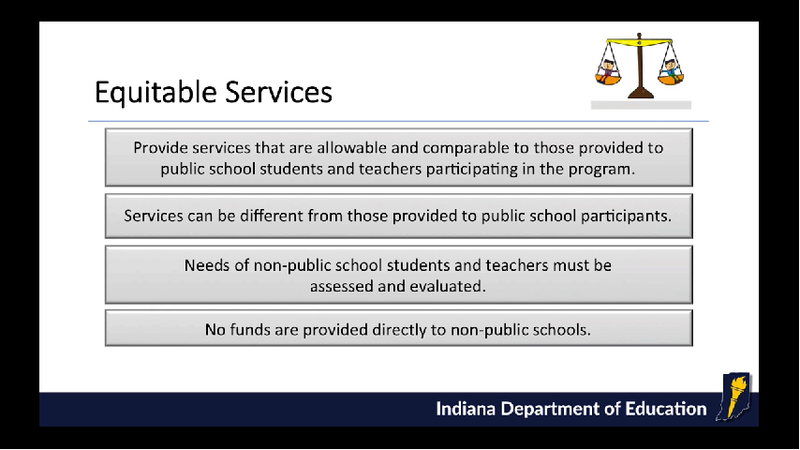 What are "equitable services" for students in private, non-public schools? 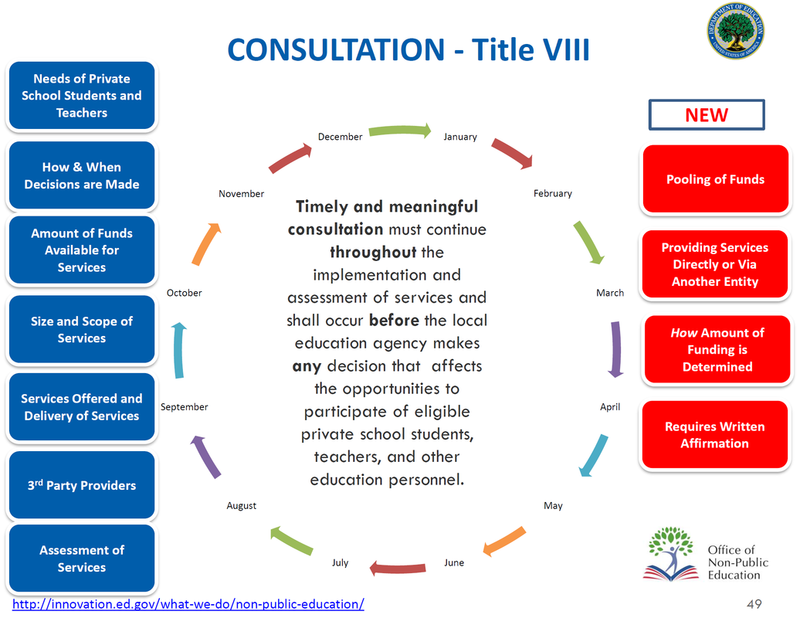 "Title" dollars now follow the student -- even if the student attends a private, non-public school located outside of the Public School District boundaries. Thus, the Public School ESSA administrator must engage in timely and meaningful collaborative planning with each private school administrator at which a District's students attend, regardless of where that school is located -- even in another state. Each private school administrator must provide written documentation to each Public School District where the private school's students live to indicate whether a private school will participate in all programs (Title I, II, III, IV), some, or none available from that District. Unlike the past, these conversations will occur with EVERY School District from which a private school draws students, NOT just the Public School District in which a Private School is physically located. A decision to decline participating robs private school students of programs and services that Congress provided them in ESSA. A decision to "opt-out" should never be made for expediency or convenience. Private schools may not operate their own program. NO FUNDS MAY BE PAID DIRECTLY TO THE NON-PUBLIC SCHOOL. ALL services and materials for non-public students must be secular, neutral, and nonideological. Programs operated on non-public sites are essentially "off-site" public school programs, not private school programs. Program related equipment and materials used at the private school are limited to use only by students selected for participation. These may not used by others, or for any other purpose. ​Concerns of non-public administrators should first be directed to representatives of the Public School District. ​After attempts to resolve issues informally, Private School administrators may report concerns about the Public School District to the ESSA Equitable Participation Ombudsperson at the State Department of Education. The Public School District may remove a program from a non-public site when objective data show it is ineffective, or when compliance issues persist. Students who meet "poverty" criteria generate funding. Only students who demonstrate educational need may actually receive services. The chart below, and the explanation, shows how students are selected. Only students who meet the criteria at one level proceed to the next "test". A student selected to receive services will have met ALL criteria, without exception. AT REGISTRATION TIME (IDEALLY), COLLECT INFORMATION about the School District and the specific public school the child would attend if NOT in the private school. IDENTIFY students who are failing or at risk of failing - based on MULTIPLE objective criteria (i.e., standardized test scores, report card grades). Teacher or parent recommendation IS NOT a factor for identifying potential participants. PRIORITY RANK eligible students from most at-risk to least (based on data above). OBTAIN a report from the LEA/SEA showing funds available for Title I, II, III, and IV. SELECT a provider (based on collaborative decisions made during Timely and Meaningful Collaboration). SERVE the maximum number allowed based on dollars available and the vendor's per-pupil cost.